Medical Services Provided - Singletrack Health P.C. Vaccinations – We recommend that our patients follow the standard vaccination schedule endorsed by the Centers for Disease Control, American Academy of Pediatrics, and American Academy of Family Practice. Next to sanitation and refrigeration, vaccination is one of the most important measures to improve health worldwide. If our patients are sick or hurt and need admission to UP Health System Marquette, we care for them there. Our belief is that medical errors are minimized, and patients are cared for in the manner that is consistent with their wishes, when care is provided by the physician that knows them best – their personal physician. We involve surgeons and specialists in our patient’s care when needed. We provide ‘low risk’ obstetrical care, which means we take care of healthy moms who are expecting healthy babies. Care for higher risk pregnancies is available in our community through OBGYN Associates of Marquette. We promote natural childbirth. Our goal is a healthy mother and baby. We actively promote immediate skin to skin contact after the birth, even after C-sections. This is the best way to ensure bonding and successful breast feeding. We support open discussion of your birth plan preferences. We do not routinely perform episiotomies. We encourage perineal massage at the end of your pregnancy and during delivery, and warm compresses during birth as means to avoid trauma to the pelvic floor. We encourage walking and other movement during labor, and your choice of the best position for you to birth your baby. While we do not encourage routine use of intrathecal or epidural anesthesia, it is available for those who chose it. We deliver our patients at UP Health System Marquette. We share patient care (call) with Drs. Stevens, Hardie, and Madosh, who share our philosophy about childbirth. 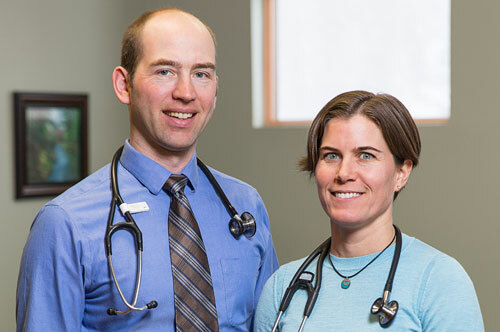 In the event that you need delivery by C-section, we refer to OBGYN Associates of Marquette. To complement the services we provide, we encourage support from a doula. We have many years of experience working alongside Doulas of Marquette. We promote breastfeeding as the most appropriate and healthy way to feed your newborn. Our staff will complement the other breastfeeding resources available in our area with daily phone calls, opportunities for frequent office visits for hands on advice, and support and referral if needed to peer lactation support and lactation consultants.